This is a guest post by Dr. med. Holger Silbernagl, co-owner at hausaerzte-gruenwald.de. Beginning in April 2018, the German Minister for Health, Jens Spahn, complained about insufficient opening hours for patients in German medical practices. According to the Minister´s plans, the obligatory minimum opening hours were to be increased from 20 hours/week to 25 hours/week. At the same time, the Minister was announcing new laws to improve the availability of preset appointments for medical treatment in German practices in all specialties based on the extended opening hours requirement. The Minister's approach resulted in an intensive public discussion fueled by an aggressive push by the media. We succeeded in proving the effectiveness of the German Health Minister's campaign. Since we are continuously monitoring our patients' satisfaction factors in all essential fields by utilizing Exentrim FeedbackSwift as an online and offline survey and evaluation tool to improve our practice quality, we succeeded in proving the effectiveness of the German Health Minister's campaign through our patients' satisfaction level concerning accessibility based on practice opening hours. As to our practice for General and Family Medicine: We delivered 6.5 hours of opening time 4 weekdays and 4 hours on Wednesday which equated to 30 hours per week. During these hours, three medical doctors were „on stage“ and treating patients continuously. Besides those scheduled working hours, we were seeing patients with preset treatment appointments and doing house visits, resulting in an overall medical activity exclusively for our patients of at least 11 and up to 14 hours every working day for each medical doctor. 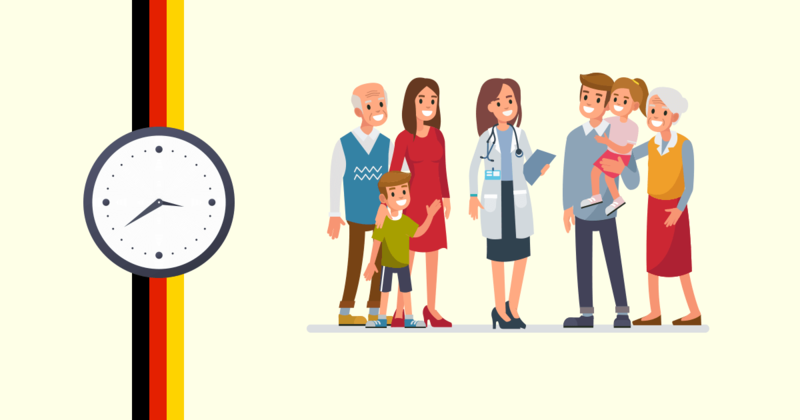 In the period from April 2016 to July 11, 2018, the range of satisfaction with our practice's opening hours consistently had been a positive perception by our patients of between 86% and 88% for all patient groups. In the period from July 7, 2018, to October 31, 2018, which was in the midst of the heyday of public discussion and overall negative perceptions of German practices' performance, the satisfaction with our own practice's opening hours was decreasing from around 88% down to 72,22%. During the period of November/December 2018 with the discussion calming down, validation that our opening hour times were agreeable with our patients was clearly demonstrated in the recovery of our patient satisfaction in this area to a positive perception of up to 85%. Since the public discussion had been concluded for some time and the resulting law instituted by the German government which required German medical practices to offer extended availability for their patients, we decided to extend our Wednesday working hours by opening the practice in the afternoon beginning in January 2019. Evaluating our Exentrim practice survey's results, we could demonstrate the impact of public perception caused by governmental strategies on our patients' views of our medical practice. The results based on our Exentrim importance ratings mirrored the reactions from „yes, the government's activities have opened our eyes...“ to an opposing reaction „I refuse the campaign“ and therefore, I rate it as „not important“ in the Exentrim survey. In addition, we gained statistical indications that female patients have been more influenced than male patients in our practice in terms of showing their support for the Health Minister's approach.